Existing loading protocols for quasi-static cyclic testing of structures are based on recordings from regions of high seismicity. For regions of low to moderate seismicity they overestimate imposed cumulative damage demands. Since structural capacities are a function of demand, existing loading protocols applied to specimens representative of structures in low to moderate seismicity regions might underestimate structural strength and deformation capacity. 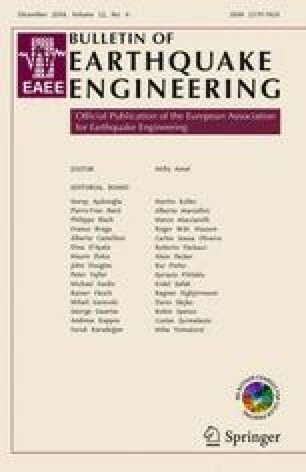 To overcome this problem, this paper deals with the development of cyclic loading protocols for European regions of low to moderate seismicity. Cumulative damage demands imposed by a set of 60 ground motion records are evaluated for a wide variety of SDOF systems that reflect the fundamental properties of a large portion of the existing building stock. The ground motions are representative of the seismic hazard level corresponding to a 2 % probability of exceedance in 50 years in a European moderate seismicity region. To meet the calculated cumulative damage demands, loading protocols for different structural types and vibration periods are developed. For comparison, cumulative seismic demands are also calculated for existing protocols and a set of records that was used in a previous study on loading protocols for regions of high seismicity. The median cumulative demands for regions of low to moderate seismicity are significantly less than those of existing protocols and records of high seismicity regions. For regions of low to moderate seismicity the new protocols might therefore result in larger strength and deformation capacities and hence in more cost-effective structural configurations or less expensive retrofit measures. The authors thank the two reviewers for their comments that helped to improve the manuscript. Financial support for this research was provided by the Swiss National Science Foundation within project NRP-66 (Resource Wood, Project No. 406640-136900). The opinions, findings, and conclusions expressed in this paper are those of the authors and do not necessarily reflect those of the sponsoring organization.